Rawtenstall railway station serves the town of Rawtenstall in Lancashire, England, and is the northern terminus of the East Lancashire Railway. It was formerly on the national railway network on the line to Bacup as well as Bury and Manchester. The original railway station opened in 1846 as part of a line from Clifton Junction built by the East Lancashire Railway (later incorporated into the Lancashire and Yorkshire Railway). The line reached Waterfoot in 1848 and Bacup in 1852. For most of its life the station was on a through route for passenger services between Manchester and Bacup via Bury. After being listed for closure under the Beeching Axe passenger and goods services to Bacup were withdrawn on 3 December 1966 (up to the last day services were regular at least every half an hour, every fifteen minutes at peak times and on Saturdays) and passenger services to Bury on 3 June 1972. 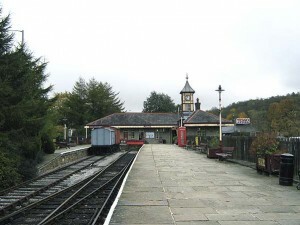 The station itself was closed in 1980 when a regular coal train was withdrawn by British Rail. 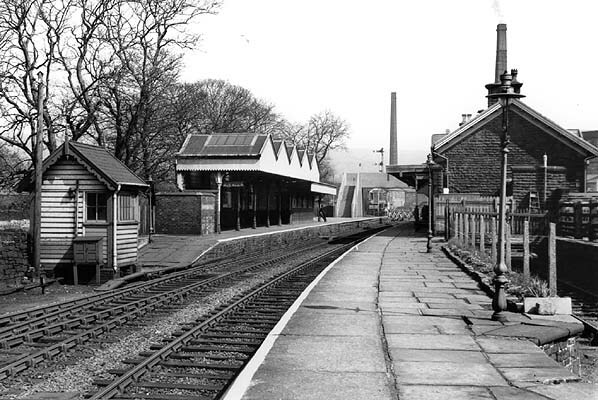 The station was then rescued and saved in 1987 by the ‘then newly re-opened’ East Lancashire Railway. The new Rawtenstall Station was opened in 1991 when the East Lancashire Railway extended from Ramsbottom. Looking northeast at Rawtenstall station in October 2010. The platform to the left is the remaining section of the down (to Bacup) platform. The station building was constructed in 1991 in the style of an ELR station. It sits accross the original trackbed. The station has been extensively rebuilt by the East Lancashire Railway, as nothing was left of the original buildings at closure. Part of the current station building lies across the former route on towards Bacup. The station has a ticket office and waiting room in the main building. The waiting room contains the original fireplace, and the original seats. The waiting room recently went through a restoration project, to make the station as original as possible. The ticket office is in the centre of the station. Along the platform there is also a small wooden waiting shelter. There are two platform faces, however only the main one is available for regular passenger services owing to the limitations of the signalling currently provided. Rawtenstall West signal box survives at the Bury end of the station, next to the gated level crossing. This currently houses the crossing keeper, who works the gates by hand, on the ground. There is no fixed signalling apart from a ground frame to control points for the run-round loop and connection to the second platform, though there is a proposal to install a Manned Barrier Crossing (MCB) in place of the hand-worked gates, which are life expired.